Prince Leaf, son of Cuan and survivor of the Lenster royal family, lives a life on the run from the Empire. Along with the knight Fin and Nodion’s Princess Nanna, he sought refuge in various cities in the Thracia peninsula, before finally settling down at a small village called Fiana. There, he is looked after by Evayle, a powerful female swordfighter, and grows up with her and the youths of Fiana. At the eastern land of Isaac, Sigurd’s son Celice, initiated a liberation movement and a new age for Jugdral was arriving. In the year 776 of the Gran calender, Leaf, now 15 years old, decides that it is time for himself to embrace the Holy War. games yet, Thracia 776 did not sell as well as previous iterations. 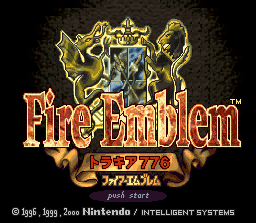 Thracia 776 is a sidestory to Genealogy of the Holy War, and takes place around the halfway mark of that game (hence why it is often referred to as a midquel). Although it is directly related to events that occurred in Genealogy of the Holy War, the story is well-separated, so it is easy to pick up and understand. Unlike the previous game, the focus is on a smaller territory and on relations and history that were not discussed prior, thus allowing for a deeper view of the world. Now you could see the small soldiers who fought alongside the greats, as well as the impact of the war on the civilians of the world. The game is held in high regard by many fans, who rate it as one of the best and challenging games in the series. 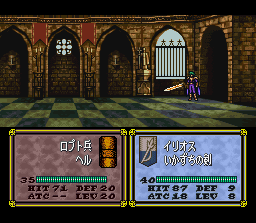 Although similar to Genealogy of the Holy War, the graphics were greatly improved, especially those of the battle maps. New elements such as capturing and rescuing were implemented, backed up by those introduced previously, which made the game more complete than ever. The game also featured a high difficulty level. As a result, the resulting satisfaction from beating the game can be enormous. Also known as sidequest chapters. 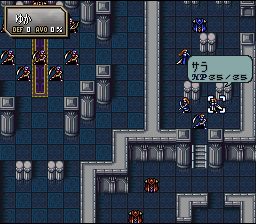 Gaiden chapters are optional missions and require fulfilling special criteria to unlock. The rewards from playing such chapters include rare items, extra characters and dialogue. In previous games, the main campaign was relatively linear, as you progress from set chapter to another. In this game, it was possible to choose one of two paths through the game, although only one path featured and it only lasted for two chapters. Instead of just conquering castles you could now beat chapters by escaping to a designated point, or surviving for a certain amount of turns. This helped to vary missions, and meant the player had to adapt new tactics instead of just obliterating enemies. Characters possess a Fatigue stat, which rises as they fight, use staves or perform other actions. When the character’s Fatigue rises past their HP stat, they become fatigued and must sit out the whole of the next chapter. A character’s Fatigue could be reset by giving them rare Stamina Drinks. Sadly, this feature (along with a few others) was not carried onto future games. Like in other strategy games, Fog of War obscures the player’s vision, with characters only able to see parts of the map within a certain radius of their position. This is in effect in certain chapters, usually Gaiden chapters. Characters could use Torches or the Torch staff to increase their radius of vision. Eyrios about to fight a Loputo Mage. In previous games, only the main characters had the privilege of having these. That is, specific weapons that are unique and only usable by a particular character. Genealogy of the Holy War had similar weapons, but locked to major holy blood. However this game features more personal weapons, which could be used by a larger variety of characters. In Genealogy of the Holy War, only leader of armies had leadership stars, which increased the performance of soldiers under their leadership. This time, some important playable characters also have leadership stars. These characters are usually relatively weak, so it gave players incentive to use them, to boost the effectiveness of other characters. Some characters have Movement stars, which appear in their status screen. Each Movement star increases the chance of the character being able to act again after waiting. Although the effect is random, it can be very useful when it activates. Unless it’s the enemy of course. Build (or Constitution) is an additional character stat, which lowers the speed loss when holding heavy weapons (although magic tomes ignore Build). Build also has its own growth rate, although is very small for most characters. This helped to balance the game as bulkier characters could now outspeed speedy, but light, characters when they both carry heavy weapons. Weapon ranks already featured in the previous game, but they could now increase outside of promotion, thanks to the introduction of weapon experience. By using a type of weapon often, such as swords, characters would gain weapon experience for that type and eventually increase their weapon rank in that type. Weapon experience built up discreetly, although later games provided a progress bar besides the weapon rank. Characters could now rescue allies, to transport them or protect them from danger. To rescue, the character must have greater Build than the unit being rescued, or be mounted (on horse, pegasus or dragon). Mounted characters or those with maximum Build could not be rescued. Last seen in Mystery of the Emblem. Like in that game, mounted characters could get off their mount to avoid tricky terrain, weapons effective against them or to move indoors. In indoor maps, all mounted characters are automatically dismounted. When dismounted, most characters can only fight with swords. This gives an extra incentive to build up the lower swords weapon rank for most mounted units. Thieves could steal in the previous game, but they were limited to just stealing Gold. In this game Thieves can steal any weapon or item from the enemy! However what could be stolen depended on the character’s Build stat, which most Thieves normally lack. Still, there was the potential for mass item-raiding sprees. A hidden feature and the first of its kind to appear in Fire Emblem (disregarding Gaiden‘s Sound Test), which allowed players to listen to the game’s soundtrack in-game. This could be unlocked by obtaining a good rank in the main game.